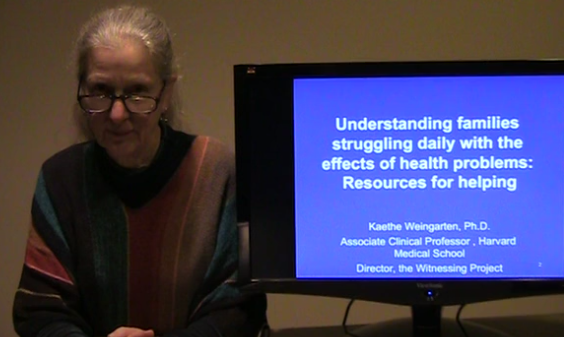 This video features Kaethe Weingarten, from the USA, sharing ideas and resources for ways to understand and assist families struggling with the effects of chronic physical health difficulties. Kaethe has also provided readings, weblinks and references for further information. Thankyou for this very interesting presentation about the ideas/practices you have been using in your work. There are so many ideas you spoke about and they got me thinking about my own work. The work I do is mainly focussed around issues of mental health and socio/political trauma related to violence, but I think they have many cross-overs and interconnections with physical health issues. I have been drawn to this work due to the long history, experience and effects this has had in my own family over many generations. This insider knowledge has greatly contributed to my sense of ease and comfortableness with this work, a point you spoke about in the beginning of your video. The work I am engaged in uses narrative ideas with alot of emphasis on collective ways of working. These ways of working make the most sense to me because they tackle the stigma and individualisation that often define the ‘illness narrative’ of the effects of violence and enables myself and others to take action by using our insider knowledge to create resistance and change. I am becoming increasingly involved in peer work projects to create even more space for these alternative responses to chronic illness and sorrow. The metaphor of the boat you described at the end of the video really stood out for me. It was so clear and accessible. I have found the use of metaphors to be one of the most effective ways of working with people, they have a lightness and creativity that is hopeful and instantly create opportunities for discernment and spaces for preferred stories to be told. Thank you for your response. My professional work has revolved around the idea of witnessing violence and violation. I have had two parallel tracks, one being the kinds of witnessing that happen in families when there is an ill family member and the other when we are unintentional witnesses to domestic or political violence. I couldn’t agree more about the “crossovers” as you call them. And certainly, as you allude to, the intergenerational consequences of both. I agree with you that breaking down the isolation that so often accompanies illness can be crucial to helping people cope. Even when people are too sick to leave their homes, the internet can provide ways of linking them to others. Peer to peer projects can be so useful! I’d like to know more about the ones with which you are involved.